Assoc. 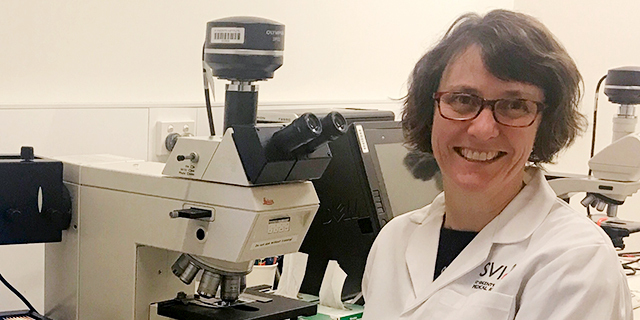 Prof. Natalie Sims directs the Bone Cell Biology and Disease Unit at St. Vincent’s Institute and is an NHMRC Senior Research Fellow and Principal Research Fellow at The University of Melbourne. She completed her PhD in 1995 at the University of Adelaide, and started her own laboratory in Melbourne in 2001 after postdoctoral studies at the Garvan Institute (Sydney) and Yale University. She uses histomorphometry, micro-computed tomography and FTIRM to study genetically altered mouse models and uses in vitro systems to study cell biology of the skeleton. She has defined the roles of Oncostatin M, Cardiotrophin 1, and Leukemia Inhibitory Factor on the development and maintenance of the skeleton, and has developed theories of bone cell communication, particularly with respect to the concept of “coupling”. Her current work focuses on paracrine control of the skeleton, particularly the way parathyroid hormone, IL-6 and STAT1/3 signalling influence bone formation and destruction. She has >100 publications and review articles. Dr Sims is a board member of the American Society for Bone and Mineral Research (ASBMR). She is a Senior Editor of the journal Bone and an Editor at the Journal of Biological Chemistry (JBC). Her work has been recognised by the ASBMR Fuller Albright Award (2010) and the International Bone and Mineral Society Herbert A Fleisch Award (2013).